Immunogen: Synthetic peptide corresponding to the sequence near the N-terminus of human Survivin. Application Notes: Detects a band of ~17kDa by Western blot. Scientific Background: Survivin is a 16.5 kDa protein and the smallest inhibitor of apoptosis (IAP) so far identified. It is involved in the inhibition of apoptosis and cell division. Survivin expression has been reported at high levels in embryonic tissues, but at low or non-detectable levels in normal tissue. Survivin regulates the G2/M phase of the cell cycle by associating with the mitotic spindle microtubules and directly inhibits Caspase-3 and Caspase-7. Survivin is selectively expressed in the most common human cancers and is associated with clinical tumor progression. It has been proposed as a tumor marker for breast cancer, and Survivin expression has been correlated to clinical outcome in melanoma patients. Down-regulation or loss of Survivin is thought to inhibit the growth of tumor cells. Further, it has been indicated that Survivin epitopes may serve as important targets for anticancer immunotherapy approaches, and that Survivin is a rational target for apoptosis-based cancer therapy. It has also been proposed that Survivin may be used as a universal tumor antigen for immunotherapy. 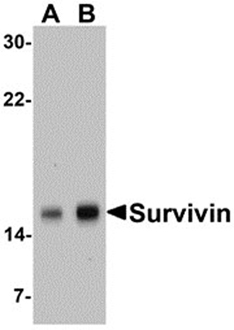 Immunocytochemistry analysis of Survivin in Jurkat cells with Survivin antibody at 5µg/ml. Western blot analysis of Survivin in MOLT4 cell lysate with Survivin antibody at (A) 1 and (B) 2µg/ml.